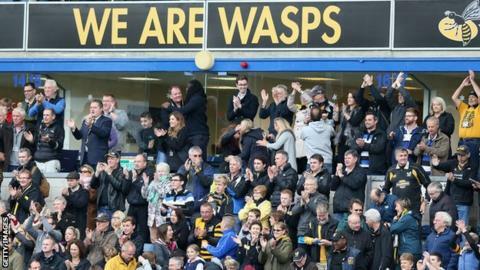 A large proportion of supporters will stick with Wasps when they move to Coventry, according to chief executive Nick Eastwood. Wasps will play in the Ricoh Arena from December - 82 miles north of their current home in High Wycombe. "I think the majority of supporters will come," said Eastwood. "A number of supporters at the fans' forum said they just can't do it because of work commitments. But most people have said they are coming." Nearly 3,000 people have signed a petition to protest against Wasps' move, which was confirmed as part of a deal that sees the club buy a 50% stake in the Ricoh Arena. "I wasn't surprised by the lack of protests, to be quite honest. "One thing that has jumped out at me is how intelligent our supporters are. "Nobody can doubt their loyalty and passion, but I understood frustrations in the early part of the week. "I thought the supporters were intelligent enough to react in the right way once everything was explained and outlined fully." Wasps were reportedly an hour from administration when businessman Derek Richardson took over the club last year, but they continue to lose £3m a season playing at Wycombe Wanderers' Adams Park ground and Eastwood has said the move will secure the long-term future of the team. The former Premiership and Heineken Cup winners attracted 7,397 fans for the 29-22 win over in-form Bath on Sunday, their largest crowd of the season, and there were no protests during the game. "I'm hugely appreciative the fans got round the team and separated the decision from the playing side of things," Eastwood. "The only constant in the last 20 years of Wasps' history was a lack of financial stability, and we've ended that now. "We looked at probably 15 sites in and around London in the last two years. We were left with two options; stay where we are, lose a shed load of money and say a prayer that a miracle's going to happen, or move. "Staying put would have been a one-way ticket to going bust. Once we made that decision, Ricoh was by far and away the best option. It just came down to move or die."